Cassie Brockamp has over 21 years of experience helping her clients and class members reach their goals through personal training and group fitness. She has received and maintained many top certifications for Group Fitness and Personal Training, such as: ACE-CPT, ACE-CGFI, Les Mills Body Combat, RPM, CX Worx, and ACE Fitness Nutrition Specialist. Cassie’s passion stems from helping people learn and adopt new and healthier lifestyles that they can do for the rest of their lives. Fitness is not a destination; it is a journey. Her knowledge of what the body is capable of and what the body needs has always led back to yoga. While training intensely for a Fitness Competition, Cassie used yoga to keep her body in balance and her mind at ease. She firmly believes that she was able to take her training to the next level through the benefits of yoga. She also promotes yoga as the perfect cross-training tool for her clients in their efforts to reach their goals. 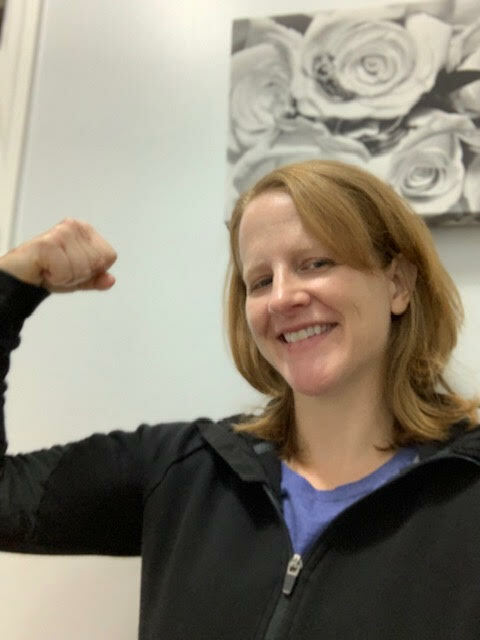 In Spring of 2019, Cassie completed her 200 Hour Yoga Teaching Training here at Blue Ridge Yoga. Now as a Certified Yoga Teacher, she plans to combine her fitness background and knowledge of strength training and core integration with the mind/body connection of yoga. It is the perfect combination of what the body is capable of and what the body needs! Born in England and coming to America (by way of Denmark) at 8 years old, has given Cassie a unique background of a broad understanding and acceptance of many different cultures, people, and ways of life in general. As a “native” East Tennessean, Cassie has lived in the Knoxville/Lenoir City Area most of the time since moving here in 1989. She attended Lenoir City High School and then Maryville College, receiving her Bachelor of Arts in History. Then she ventured off to attend Graduate School at Mississippi State University receiving a Master of Science in Counselor Education. After working for a few years in Arkansas and the Memphis area, she came back home to East Tennessee. When Cassie is not working (or working out), she spends her time with her two beautiful, fun, and awesomely crazy daughters and her handsome, fun, and also crazy husband who keep her busy and very, very happy.